Dr. Ellen Townes-Andersonis a professor in the Department of Neurology and Neurosciences at Rutgers New Jersey Medical School in Newark, N.J., United States — about 20 miles away from the Bell Labs facility where her father Charles Townes and Arthur Schawlow filed for their maser patent in 1958. Her current work involves using laser “tweezers” (1) to grab neurons for study by placing them on electrodes. In an exclusive video interview with Laser Institute of America (LIA), Townes-Anderson recalled how her work led her to a rare collaboration with her Nobel Prize-winning father. 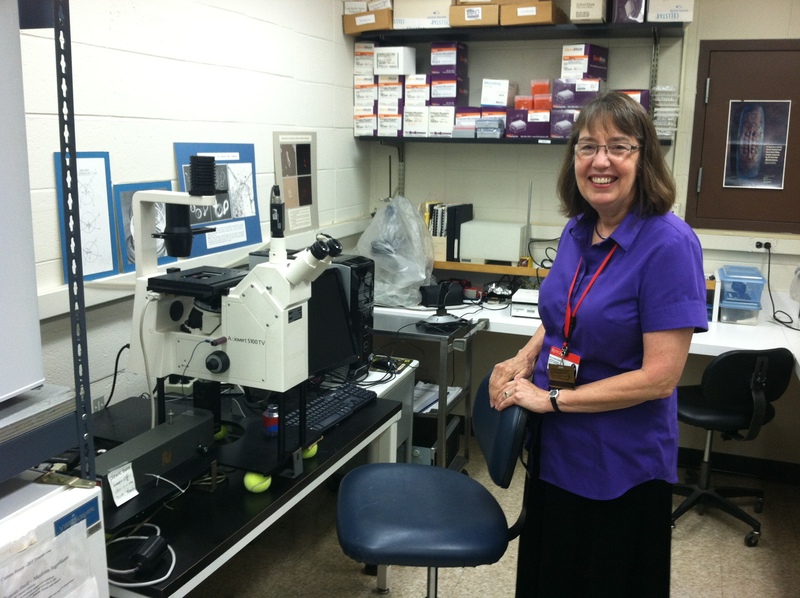 Dr. Ellen Townes-Anderson with her optical trap equipment in her lab at Rutgers New Jersey Medical School in Newark, New Jersey, USA. Credit: Geoff Giordano / Laser Institute of America. Her father helped set up a meeting with Arthur Ashkin, inventor of the optical tweezers, while Townes-Anderson was working at Cornell’s Department of Physiology. Townes-Anderson developed the idea that she might be able to move nerve cells and procured funding from the National Institutes of Health to buy an optical tweezer setup. “We proceeded to try to move nerve cells, and I would occasionally see my father and show him the videos of what we were trying to do. And cells were spinning out of the trap, and it kind of wasn’t working. Eventually we were able to develop a substrate on a glass plate to which the cells would not stick.” The substrate is the same material used for contact lenses. With the new process in place, she says, “we were able to pick up whole nerve cells — and these were huge neurons (that) came from salamanders … Then we developed experiments” based on the premise of building clusters of nerve cells of the researchers’ choosing, then watching the cells’ interactions. Work in this area continues in her Rutgers lab. A graduate student of hers is using optical tweezers to move nerve cells on a microelectrode array and place cells at precise points on the electrodes. In his 1999 book “How the Laser Happened,” Townes — born July 28, 1915, in Greenville, S.C. — explained that, “Once invented, lasers found myriad uses” and noted that they had advanced to the point that “the smallest lasers are so tiny one cannot see them without a microscope.” In fact, diode lasers could become so small they can be put in a capsule and travel through the body, according to Anh Hoang in his presentation at LIA’s International Laser Safety Conference in Albuquerque in March. The versatility of these devices might provide the ability to “search and destroy tissue at the same time,” he said. Townes famously conceived the idea for the laser while sitting on a park bench in Washington, D.C. in 1951 and worked until his 99th year, maintaining an office at the physics department of the University of California, Berkeley. He died on 27 January 2015. In the year that we celebrate the 100th birthday of the late laser pioneer Charles Townes, his daughter Dr. Ellen Townes-Anderson will be a headlining speaker at the Laser Institute of America’s 34th International Congress on Applications of Lasers & Electro-Optics in Atlanta, United States, on 19 October 2015. 1 – A technique that uses a single-beam laser directed through an objective lens to trap, image, and manipulate micron-sized particles in three dimensions. The Laser Institute of America is the professional society for laser applications and safety, serving the industrial, educational, medical, research and government communities throughout the world since 1968. Visit us at www.lia.org and follow us on Facebook and Twitter.